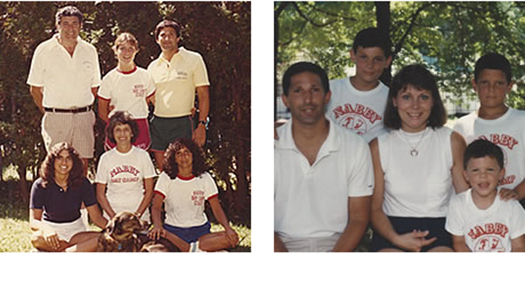 From the Nabatoffs to the Bertinos, Camp Nabby is a people-first summer day camp that has been creating wonderful memories for Westchester families since 1940. The Bertino family moved to Mohegan Lake in 1970 to become the second owners of what was then called Nabby Day Camp. For Frank Bertino the opportunity to design a summertime physical education program from scratch was the ultimate challenge—one that would test his experience as both an educator and a coach. Frank and his wife Florence (Flo) moved from the campus at Riverdale Country School in the Bronx, where he had lived and worked for 44 years. Frank’s record as an administrator and teacher was stellar, but nothing compared to his prowess on the football field. Over the span of four decades of coaching, Frank led Riverdale to 17 undefeated seasons, 17 Ivy Preparatory School League championships, and a final record of 247‑47‑6. On his arrival in Mohegan Lake, Frank immediately modified the summer program to reflect all-important values such as teamwork, cooperation, athletic development and social skills. These are the foundation of Camp Nabby’s mission to this day. When Frank passed away in 1997 his oldest son, Joe, took over the day-to-day operations. 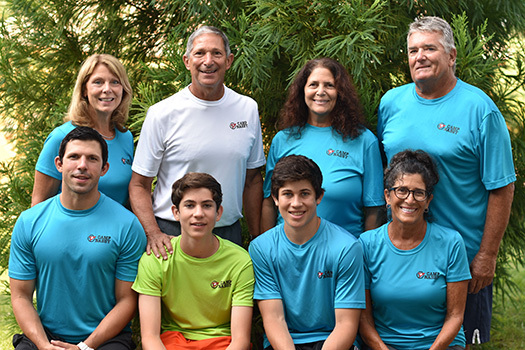 With over 35 years as a physical education teacher and swim coach, Joe continues to develop Camp Nabby into one of the finest summer programs in Westchester County. Joe is joined in the camp office by his best friend, wife and associate director, Rita. And that’s not all. During the summer months Joe & Rita work alongside sisters Gemma & Maddie, brother-in-law Dave, and son, Matt. How did Nabby get its name? Camp Nabby was named after founder Abraham Nabatoff, who started the camp in 1940. Abraham ran the camp until 1970 when the property was sold to the Bertino family. Ever hear someone described as a “student-athlete”? The pennant is a nod to the combination of athletics and education—with a little spirit mixed in there too. Who the heck is Scooter? Scooter B. Nabatoff is the official Camp Nabby mascot. Scooter is a fierce competitor, creative genius and lover of all things camp—just swing by the office to see for yourself! A camp is only as good as the family who runs it.